I’ve unpacked a few things into my new room. I have tons of closet space and a rug for my American toes. My new abuela, host dad and host mom all tackled the fan in my room, but it’s roto so we scooted the bed closer to the other fan and they cracked a joke and laughed even harder when they thought I understood. “She gets it!” I didn’t quite get it, but I’m working on it. In two years’ time, the new sounds outside my window and the new house smell will be familiar, more so than many of my other homes. I haven’t stayed in one place longer than ten months since I was 18 years old. A new kind of adventure. You know those moments when you feel homesick but you’re not sure for which home or place or person or feeling? Soul ache of some sort? Yeah. But a content, settling in, anticipatory kind, with a heart brimming with fresh memories and a head dancing with new ideas, faces, places. The fan doesn’t faze the insistent unknown insect devouring my legs. It’s hot. My back hurts from lugging supplies all over town because I’m too stubborn to take a bus and I need the exercise. 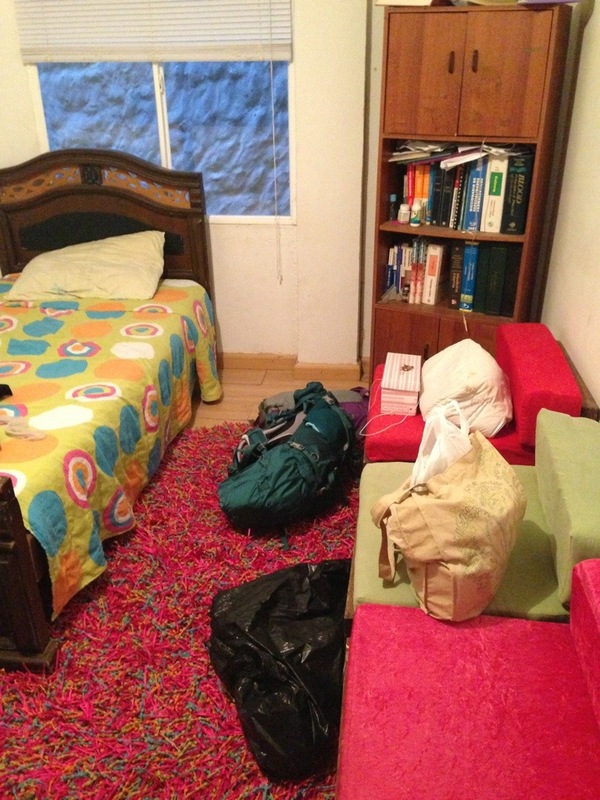 My belongings–the things that I say I need for this life in Colombia, the things the Peace Corps says I need and a few extra pairs of shoes–are all back in the suitcases. I’m watching the shadows from the traffic on my curtains for the last time; listening to the cats outside my window making kittens for the last time. Three months I’ve been here, months of memorizing Barranquilla’s addresses and training to be teachers. It feels like a long time. I feel older. Goodbye to Gutierrez, my favorite little old man with a mustache who called me a queen every morning I walked past his plastic chair outside the tienda. He looked up at the darkening sky and said, may god bless your path. Goodbye to the black wrought iron gate that pinched me yet again today and I had to steal a napkin from the perro caliente cart on the corner to stop the bleeding. Goodbye to the beautiful porch with palms and green benches outside the window where the abuela watches the street. Goodbye to these three little women who opened their house to me and shared their food, jokes, family members, tv shows and opinions with me. They were my first view of Colombian life, and boy, will I miss their arepas! These ladies are a wealth of knowledge, experiences and ideas. I’ll miss them! Goodbye to Barranquilla proper! These tree-lined carreras and hectic market stalls and sweaty buses and curious neighbors and your contradictions and colors and challenges and hopes are now a happy place for me, and I’ll be back. This weekend (and I mean the whole weekend) was hayaca time, because my host mom wanted me to try her hayaca before I move out. My current host family is from the interior, from a department/state called Norte de Santander. They moved here in grade school, but the three ladies have kept several recipes alive in the house! 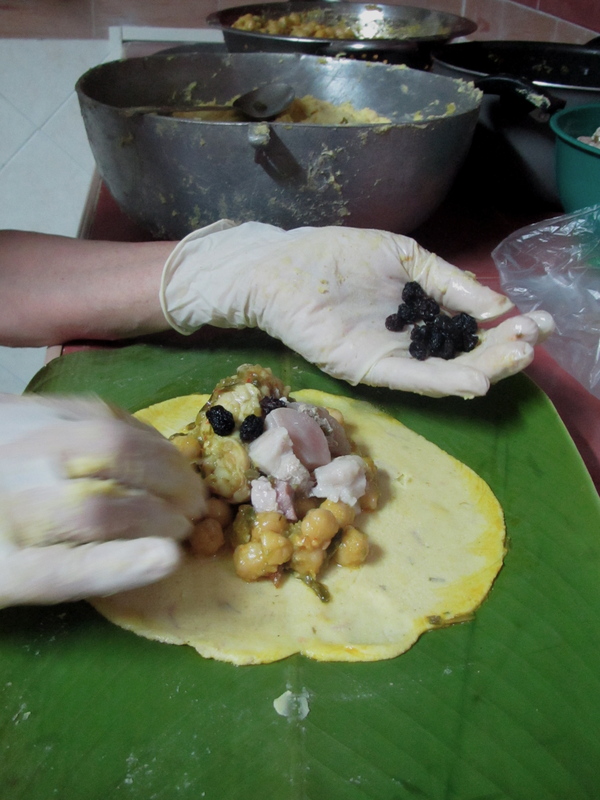 Perhaps the crown jewels of the recipe box are the hayacas in the Cucuta style, the city where they were born. 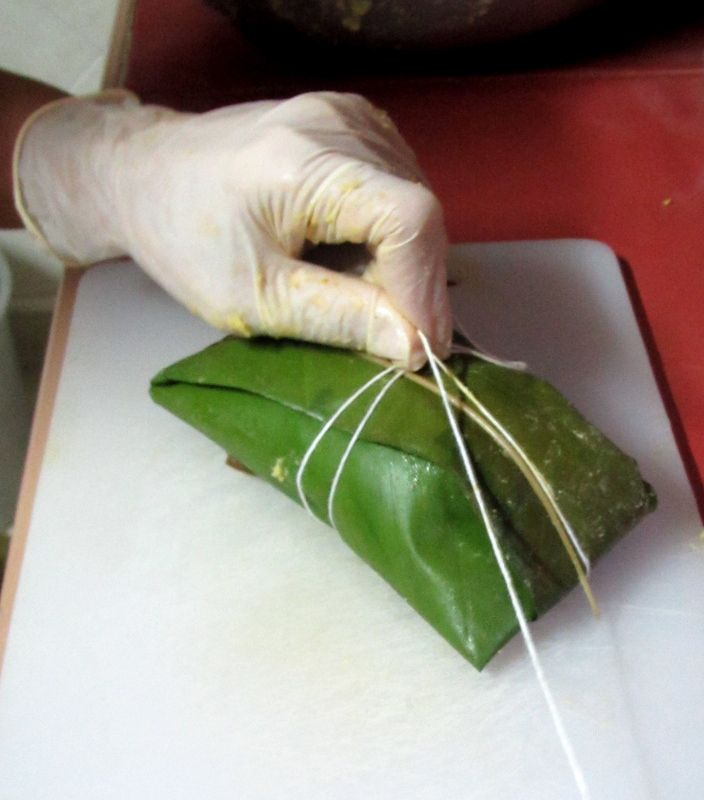 These are kind of like tamales on steroids, to give them a VERY broad translation into American cultural knowledge. My host mom woke up at 4:15 am on Saturday to start the process. Then, the process begins. 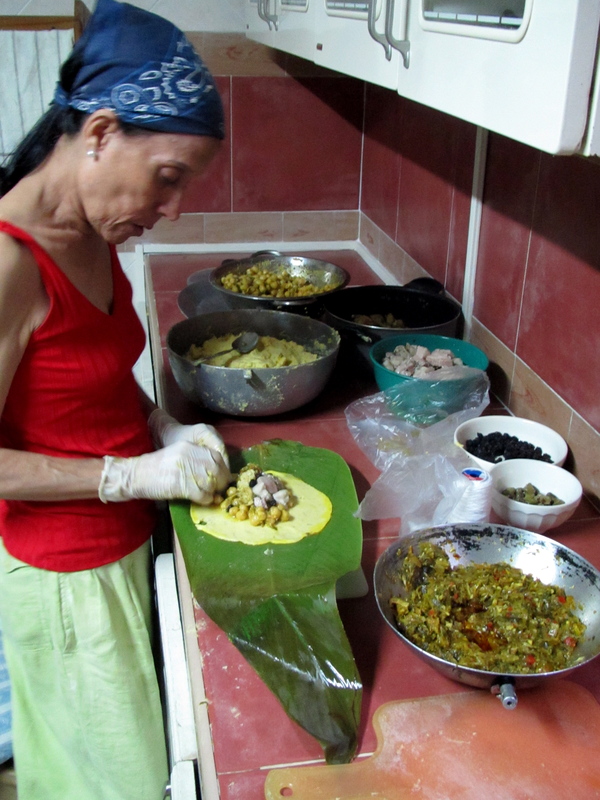 First, she preps the leaves with a swirl of oil, then she rolls a ball of masa and flattens it until it shows a print of the leaf pattern. Then come all the fillings, expertly placed into a perfect pile by the years of experience in her hands. 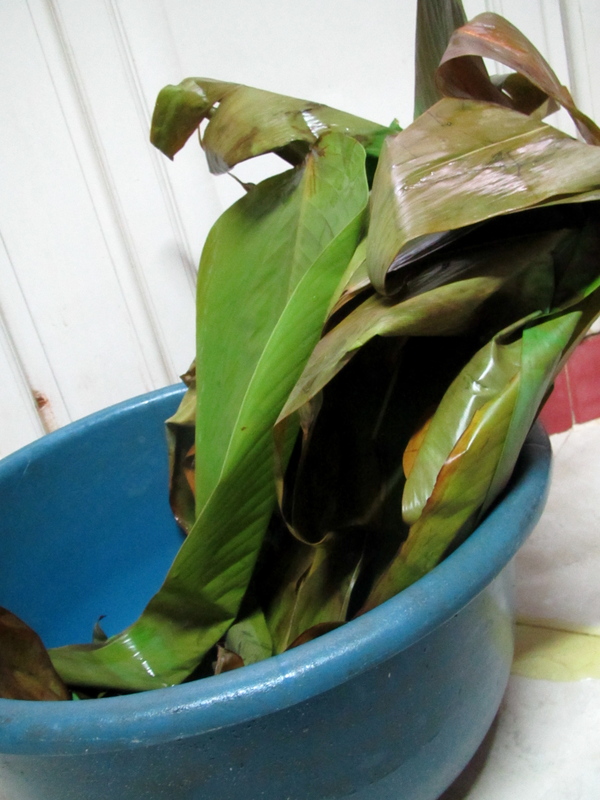 And there is one hayaca, all prepped and ready for the olla on the stove. Rinse and repeat–25 more times!! 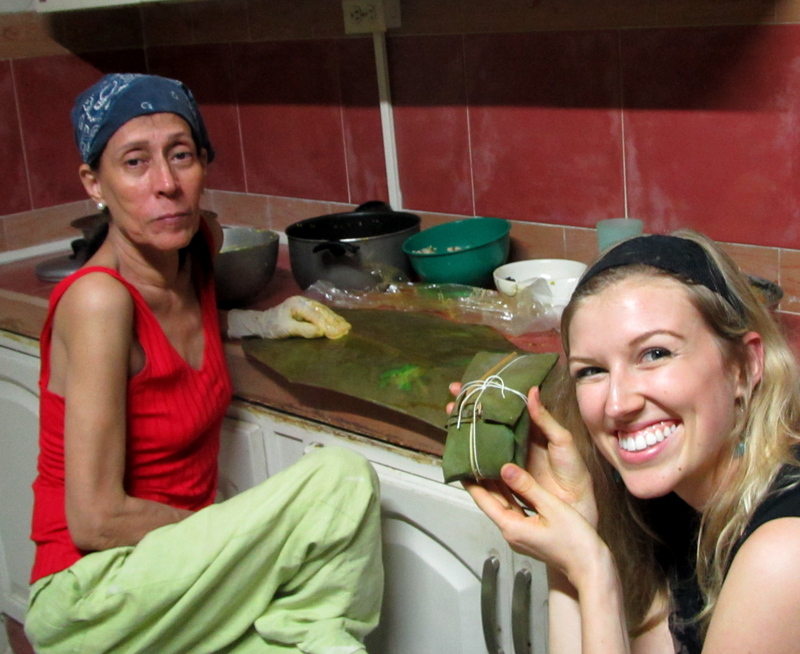 This woman is incredible, and I’m so glad she wanted me to taste the magic of Cucuta! Sunday morning we had a breakfast party with tios and tias, everyone kissing their fingertips and talking about their childhood in Cucuta. Que rico, para chuparse los dedos!